Cash Management Specialist is tasked with duties pertaining to managing money, maintaining cash applications and account reconciliation; the major duties that are listed on the Cash Management Specialist Resume include – meeting customers and determining the financial needs, providing administrative and technical support to cash management department, promoting bank services, developing presentation for new customers, maintaining records of sales, setting up customer accounts, maintaining customer records, evaluating overdrafts, monitoring all balances, providing technical support and training customers for new cash management products. Applicants for this post should have at least a high school diploma or its equivalent; most employers, however, want prior work experience as well. Strong verbal and written communication skills are required, a strong math aptitude is required, and a thorough knowledge of treasury products and services will be advantageous. Additionally, these Specialists are also expected to possess solid analytical skills to troubleshoot and solve customer issues. 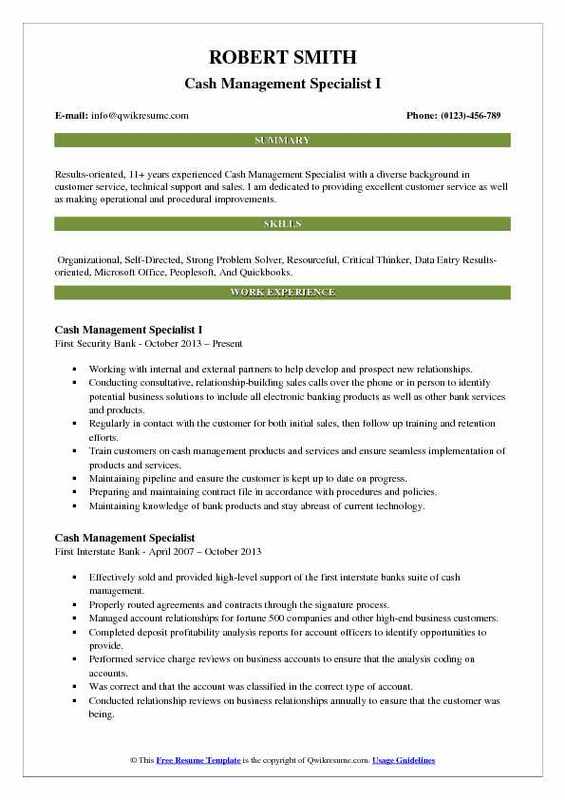 Summary : 10+ years of experience as a Cash Management Specialist is now seeking a position with a reputable firm to grow professionally while being able to utilize my skills for the betterment of the organization. Skills : Proficient In 10-key, Recovery Troubleshooting, Application Processing, Knowledge Of Mortgage Servicing And Originations, Knowledge Of QTP/QC/SQL, Word Processing, Self-sufficient, Accurate And Detailed, Positive Attitude, Multi-line Phone Operation Proficiency, People-oriented, Computer Proficient, Software Testing, Excellent Work Ethic, PowerPoint Knowledge, Superior Organization , Microsoft Office Proficiency, And Excellent Communication. Performing daily payment posting for all insurances; government and commercial payers. Posts adjustments within range accordance with cash posting guidelines. Audits and reviews payment posting and to make sure everything is correct. Working well with the collections department when and should they have any questions. Helping with the cash support specialist group should they need help to pull remits, doing additional denials, or putting batches together. Able and willing to help out with any special projects management has or needs to be done. Responsible for a broad range of collection processes related to medical accounts receivable in support of single or multiple site locations. Observe company policies and all applicable laws and regulations regarding the collection of medical claims and patient balances. Work closely with other staff to identify, resolve, and share information regarding payer trends and guidelines and updates. Possess exceptional internal and external customer service skills and actively promote the company's culture. Ensures daily accomplishments to work towards company goals for cash collections and a/r over 90 days. Understands and adheres to state and federal regulations, and to company policies regarding compliance, integrity, patient privacy and ethical billing and collection practices. Objective : 5 years of experience as a Cash Management Specialist is now looking to obtain a position in a growth-oriented environment that will utilize my work experience, education, and communication skills. Skills : Detail Oriented, Organized, Process Improvement, Leadership, Cash Management, Problem Solving, Reliable, Self-motivated, Goal Oriented, Sales, And Customer Service Excellence. Identify, analyze, sell, and support cash management products and services to existing and prospective business banking customers. Work closely with relationship managers and branch managers to attain deposit and product growth objectives. Counsel commercial customers in the selection and use of anchor bank cash management products and services to meet their needs. Analyze competitor bank statements and customer financials to prepare product and service proposals for existing and prospective business customers. Respond to RFPs in a timely, efficient, and professional manner. Present and sell Anchorbank deposit products and services to prospective and existing customers at branch and customer locations throughout the state of Wisconsin, includes responding to request for proposals as requested. Approve policy exceptions for business customers under the direction and approval of the cash management officer and/or SVP credit risk. Establish and maintain direct personalized service with commercial business customers. Assist business customers in resolving deposit account problems and complaints in a professional and timely manner. Assist customers to establish and maintain online banking products/services or other appropriate services. Conduct on-site visits to cash management customers business location(s) for customer training and audit reviews when necessary. Provide support and assistance to relationship managers (business loan officers). Provide SAG (special assets group) support to open, maintain, and close receivership, real estate owned (REO), escrow, and rent collection accounts in compliance with all policies and procedures. Assess and monitor the profitability of customers depository relationship in conjunction with relationship managers. Identify and report unprofitable relationships to the loan officer and participate in creating solutions to meet desired goals. Deliver presentations to anchor bank managers/supervisors, for department meetings, trade shows, and customer seminars. Summary : Results-oriented, 11+ years experienced Cash Management Specialist with a diverse background in customer service, technical support and sales. I am dedicated to providing excellent customer service as well as making operational and procedural improvements. Skills : Organizational, Self-Directed, Strong Problem Solver, Resourceful, Critical Thinker, Data Entry Results-oriented, Microsoft Office, Peoplesoft, And Quickbooks. Working with internal and external partners to help develop and prospect new relationships. Conducting consultative, relationship-building sales calls over the phone or in person to identify potential business solutions to include all electronic banking products as well as other bank services and products. Regularly in contact with the customer for both initial sales, then follow up training and retention efforts. Train customers on cash management products and services and ensure seamless implementation of products and services. Maintaining pipeline and ensure the customer is kept up to date on progress. Preparing and maintaining contract file in accordance with procedures and policies. Maintaining knowledge of bank products and stay abreast of current technology. Assisting business customers in resolutions and troubleshooting of problems. Providing branch and customer support for more complex banking products. Conducting annual security audit on all cash management customers to ensure all required documentation is on file and verify that ACH/wire limits are set appropriately based on customers activity. Assisting with system entry and initiation of wire transfers. Provide customer and branch support for the wire. 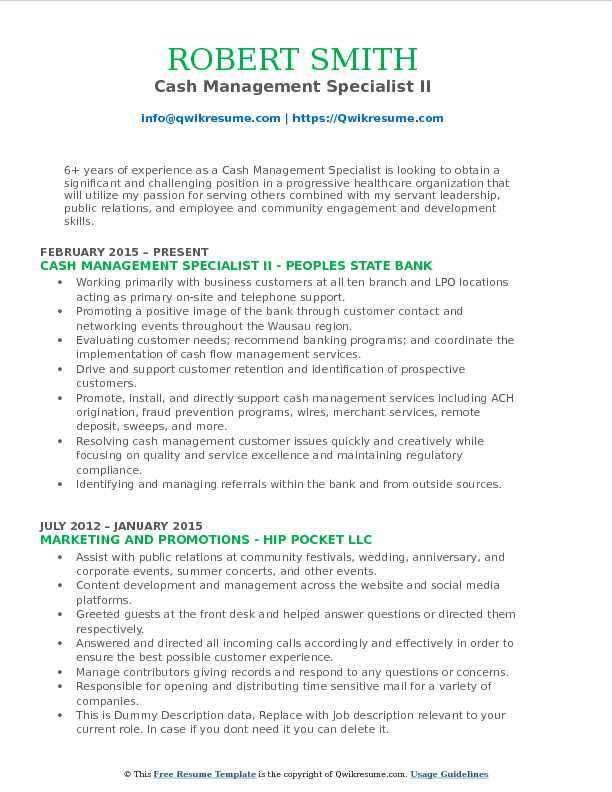 Summary : 9+ years of experience as a Cash Management Specialist, Methodical and self-motivated individual. Strong organizational and communications skills, sense of teamwork and the ability to work well independently. Skills : Excel And Outlook, Excellent Customer Service, Fast Learner, Administrative, Microsoft Office, Peoplesoft, And Quickbooks. Receiving, reviewing, and processing the setup of all treasury management and cash management products and services for customers, branches and departments. Verifying the validity of these instructions, and initiates corrective actions if they are invalid. Performing onsite installation of remote deposit. Working with IT and 3rd party processors in troubleshooting problems. Responsible for installing software and user training at the client site. Performing site visits as required. Serving as the primary contact for business customers or related parties regarding inquiries, problem resolution and servicing request. Acting as a liaison between customers, cash management officer and internal personnel to promote clear communications within the organization. Performing activities including timely preparation of documentation and agreements necessary to set up new cash management treasury management products and services required. Handling daily telephone, voice mail, email and in person request for assistance from external and internal clients experiencing problems or has questions with cash management products or services. Preparing various spreadsheets and database reports according to prescribed schedules and procedures. Responsible for complying with the various rules, regulations, policies and ethical standards governing the financial services industry including compliance with the bank secrecy act. 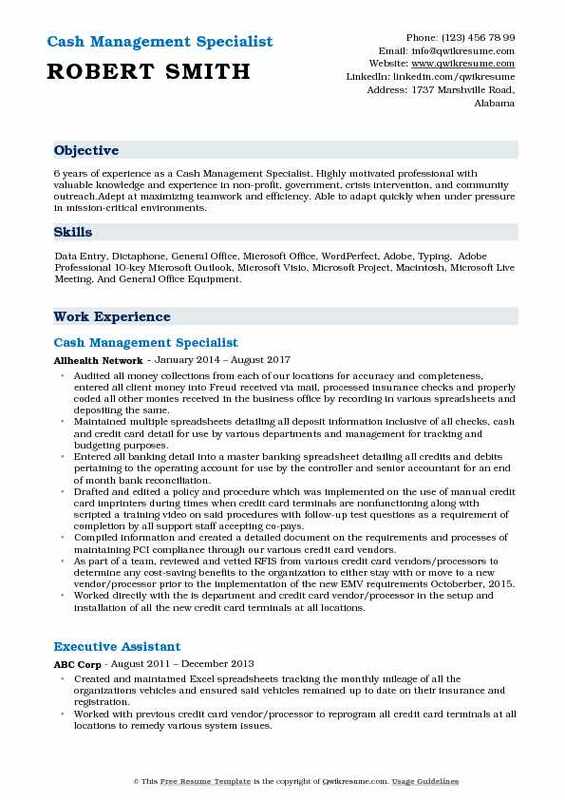 Summary : 7+ years of experience as a Cash Management Specialist with diverse expertise in cash management applications and practices.Looking to advance my career by joining a company that will utilize my extensive background and skills with an opportunity for advancement upon demonstrated performance. 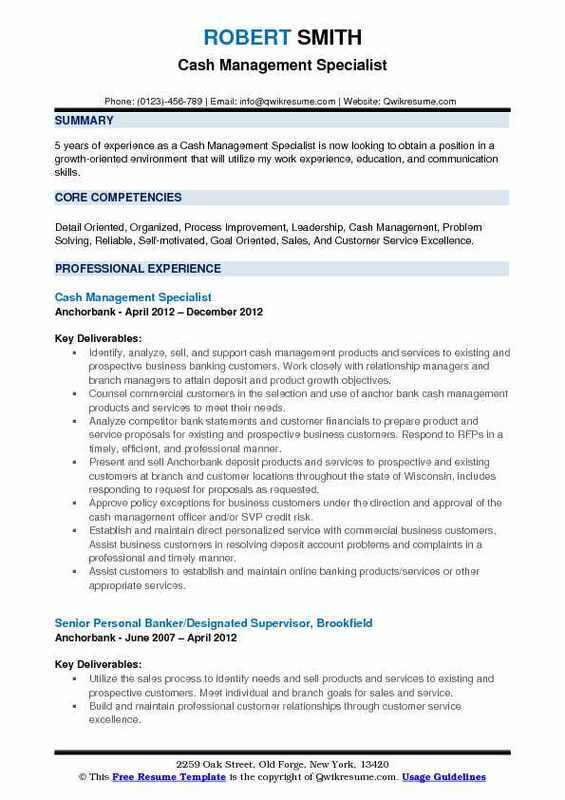 I have proficient knowledge in the payments industry including banking and merchant processing. Skills : Microsoft Office Suite, Multi-tasking, Perform In Fast Paced Environments, SAP, GSLU For Journal Entry Accuracy, Strong Analytical, Excellent Communication, Self Starter, Excellent Time Management, Ability To Meet Deadlines, And Team Player. Facilitating processing of international and domestic wires in a global market in both foreign and USD currencies, being sensitive to ever-changing banking regulations. Accurate reporting of cash receipts and disbursements for all companies within the corporation. Maintaining strong working relationships with intercompany and banking personnel. Excellent working relationships with supervisors with the flexibility to perform various tasks as requested. Ongoing implementation incorporating new worksheets into excel workbook used for daily reporting to streamline multiple sources of data into a more manageable user-friendly document. Providing documentation as requested by internal and external auditors. Verifying invoices with documentation of receipt to process for payment. 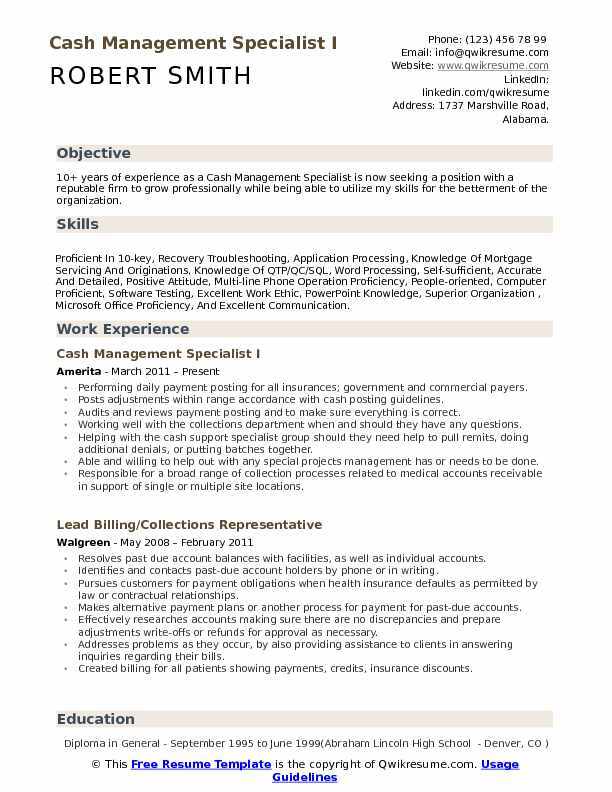 Headline : 6 years of experience as a Cash Management Specialist. Highly motivated professional with valuable knowledge and experience in non-profit, government, crisis intervention, and community outreach.Adept at maximizing teamwork and efficiency. Able to adapt quickly when under pressure in mission-critical environments. Skills : Data Entry, Dictaphone, General Office, Microsoft Office, WordPerfect, Adobe, Typing, Adobe Professional 10-key Microsoft Outlook, Microsoft Visio, Microsoft Project, Macintosh, Microsoft Live Meeting, And General Office Equipment. Audited all money collections from each of our locations for accuracy and completeness, entered all client money into Freud received via mail, processed insurance checks and properly coded all other monies received in the business office by recording in various spreadsheets and depositing the same. Maintained multiple spreadsheets detailing all deposit information inclusive of all checks, cash and credit card detail for use by various departments and management for tracking and budgeting purposes. Entered all banking detail into a master banking spreadsheet detailing all credits and debits pertaining to the operating account for use by the controller and senior accountant for an end of month bank reconciliation. 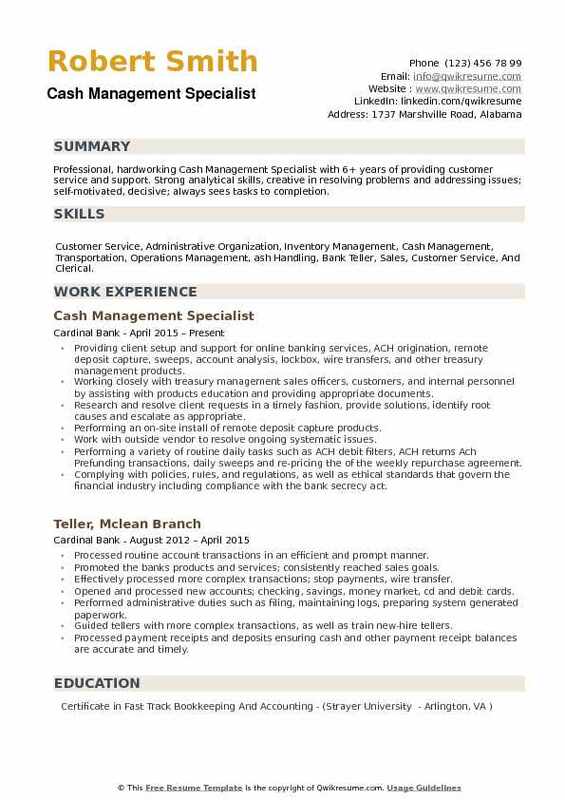 Drafted and edited a policy and procedure which was implemented on the use of manual credit card imprinters during times when credit card terminals are nonfunctioning along with scripted a training video on said procedures with follow-up test questions as a requirement of completion by all support staff accepting co-pays. Compiled information and created a detailed document on the requirements and processes of maintaining PCI compliance through our various credit card vendors. As part of a team, reviewed and vetted RFIS from various credit card vendors/processors to determine any cost-saving benefits to the organization to either stay with or move to a new vendor/processor prior to the implementation of the new EMV requirements Octoberber, 2015. Worked directly with the is department and credit card vendor/processor in the setup and installation of all the new credit card terminals at all locations. 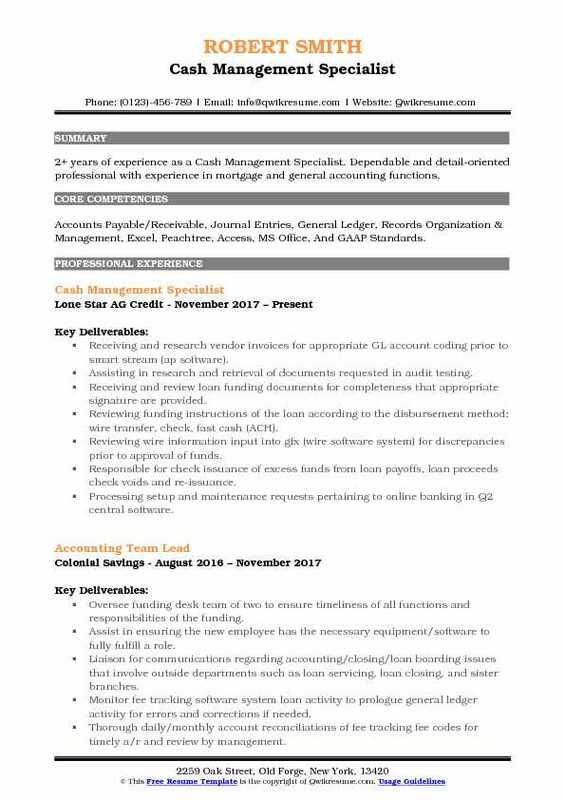 Headline : 6+ years of experience as a Cash Management Specialist is looking to obtain a significant and challenging position in a progressive healthcare organization that will utilize my passion for serving others combined with my servant leadership, public relations, and employee and community engagement and development skills. 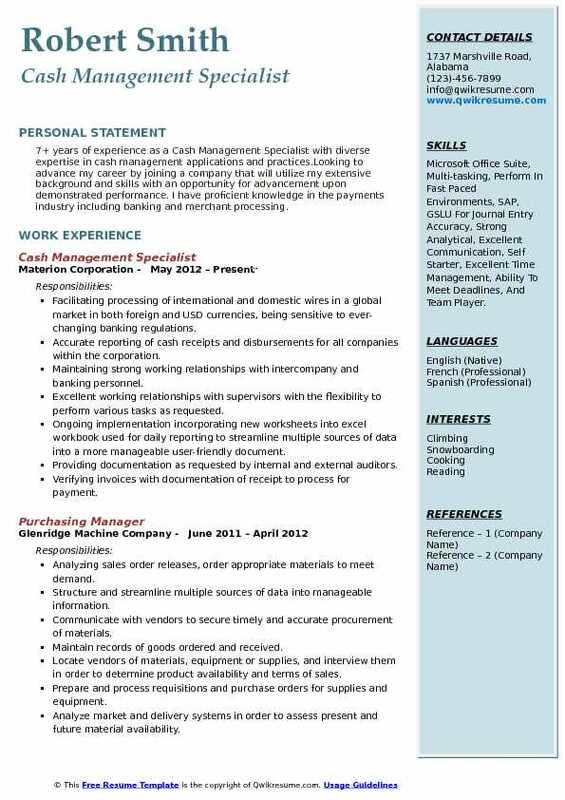 Skills : Microsoft Office Suite, Typing Speed: 70 WPM, Peoplesoft, Quickbooks, Accounts Payable/Receivable, Journal Entries, General Ledger, Records Organization & Management, Excel, Peachtree, Access, MS Office, And GAAP Standards. Working primarily with business customers at all ten branch and LPO locations acting as primary on-site and telephone support. Promoting a positive image of the bank through customer contact and networking events throughout the Wausau region. Evaluating customer needs; recommend banking programs; and coordinate the implementation of cash flow management services. Drive and support customer retention and identification of prospective customers. Promote, install, and directly support cash management services including ACH origination, fraud prevention programs, wires, merchant services, remote deposit, sweeps, and more. Resolving cash management customer issues quickly and creatively while focusing on quality and service excellence and maintaining regulatory compliance. Identifying and managing referrals within the bank and from outside sources. 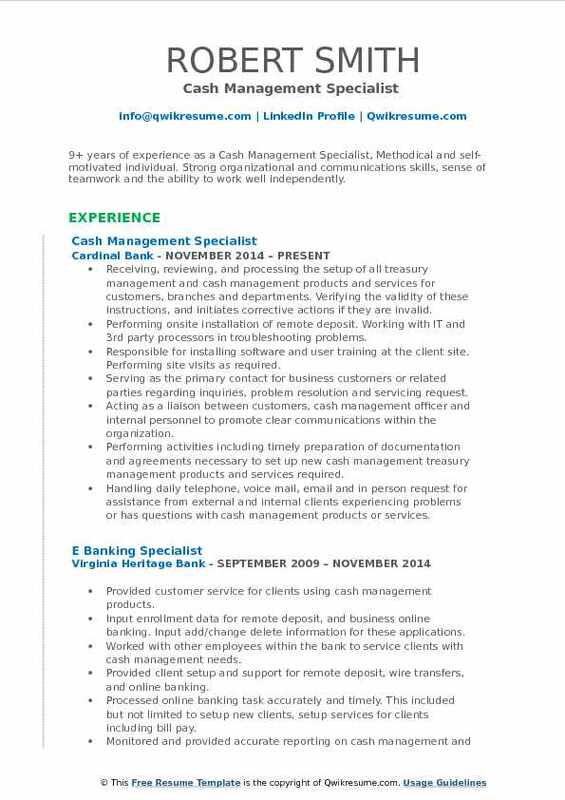 Objective : 2+ years of experience as a Cash Management Specialist. Dependable and detail-oriented professional with experience in mortgage and general accounting functions. Skills : Accounts Payable/Receivable, Journal Entries, General Ledger, Records Organization & Management, Excel, Peachtree, Access, MS Office, And GAAP Standards. Receiving and research vendor invoices for appropriate GL account coding prior to smart stream (ap software). Assisting in research and retrieval of documents requested in audit testing. Receiving and review loan funding documents for completeness that appropriate signature are provided. Reviewing funding instructions of the loan according to the disbursement method; wire transfer, check, fast cash (ACH). Reviewing wire information input into gfx (wire software system) for discrepancies prior to approval of funds. Responsible for check issuance of excess funds from loan payoffs, loan proceeds check voids and re-issuance. Processing setup and maintenance requests pertaining to online banking in Q2 central software. Prepares and secures all checks for deposit-meeting daily deadlines, coordinates with armored car and courier service for pick-up of locked bags, boxes and tapes. Summary : Dependable, process-oriented Cash Management Specialist with 9+ years of experience and a passion for managing tasks behind the scenes to ensure operational excellence. 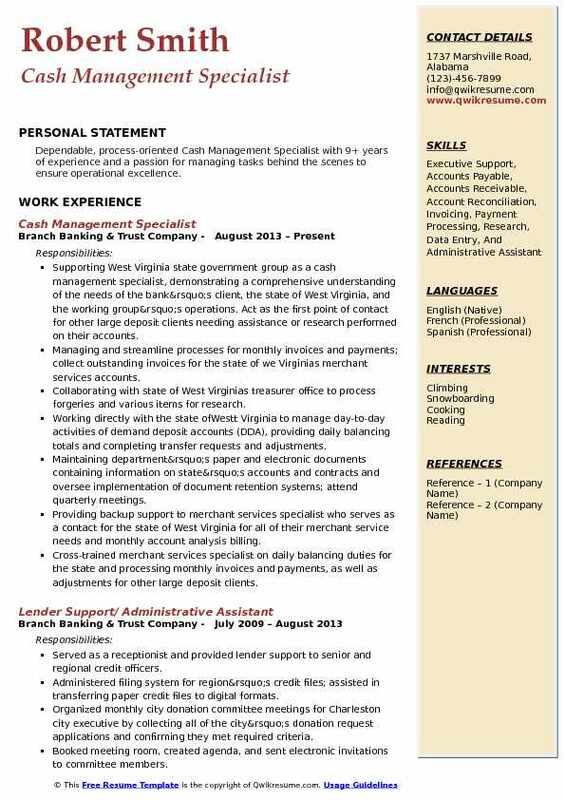 Supporting West Virginia state government group as a cash management specialist, demonstrating a comprehensive understanding of the needs of the bank’s client, the state of West Virginia, and the working group’s operations. Act as the first point of contact for other large deposit clients needing assistance or research performed on their accounts. Managing and streamline processes for monthly invoices and payments; collect outstanding invoices for the state of we Virginia's merchant services accounts. Collaborating with state of West Virginia's treasurer office to process forgeries and various items for research. Working directly with the state ofWestt Virginia to manage day-to-day activities of demand deposit accounts (DDA), providing daily balancing totals and completing transfer requests and adjustments. Maintaining department’s paper and electronic documents containing information on state’s accounts and contracts and oversee implementation of document retention systems; attend quarterly meetings. Providing backup support to merchant services specialist who serves as a contact for the state of West Virginia for all of their merchant service needs and monthly account analysis billing. Cross-trained merchant services specialist on daily balancing duties for the state and processing monthly invoices and payments, as well as adjustments for other large deposit clients. Headline : Professional, hardworking Cash Management Specialist with 6+ years of providing customer service and support. Strong analytical skills, creative in resolving problems and addressing issues; self-motivated, decisive; always sees tasks to completion. Skills : Customer Service, Administrative Organization, Inventory Management, Cash Management, Transportation, Operations Management, ash Handling, Bank Teller, Sales, Customer Service, And Clerical. Providing client setup and support for online banking services, ACH origination, remote deposit capture, sweeps, account analysis, lockbox, wire transfers, and other treasury management products. Working closely with treasury management sales officers, customers, and internal personnel by assisting with products education and providing appropriate documents. Research and resolve client requests in a timely fashion, provide solutions, identify root causes and escalate as appropriate. Performing an on-site install of remote deposit capture products. Work with outside vendor to resolve ongoing systematic issues. Performing a variety of routine daily tasks such as ACH debit filters, ACH returns Ach Prefunding transactions, daily sweeps and re-pricing the of the weekly repurchase agreement. Complying with policies, rules, and regulations, as well as ethical standards that govern the financial industry including compliance with the bank secrecy act.